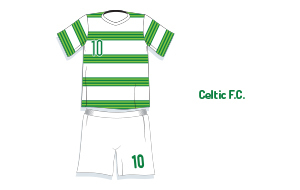 Celtic Football Club is a Scottish association football club based in Glasgow, which plays in the Scottish Premier League. The club was established in 1887, and played its first game in 1888. Celtic have a fierce rivalry with Rangers; the two Glasgow clubs are collectively known as the Old Firm. Celtic have won the Scottish League Championship on nearly 50 occassions. All ticket orders are 100% guaranteed. Celtic Tickets Seats: approx 60,000 - Order Celtic football tickets now! 1st4 Football Tickets sells SPL FC Celtic tickets for home and away matches. See Celtic playing at Celtic Park in Glasgow! You can either buy your Celtic football tickets online through our secure online booking system. Celtic is in first place at the top of the Scottish Premiership Table finishing ahead of Aberdeen, Inverness, Dundee United and Saint Johnstone due to the skill, perseverance, and quality of Brendan Rogers' men. Moussa Dembele, Scott Brown and Leigh Griffiths are high-scoring football players for The Bhoys. Other superstar Celtic footballers are Tom Rogic, Kolo Toure, Mikael Lustig and Craig Gordon. Celtic have a loyal, enthusiastic fan base that fully supports the Bhoys at Celtic Park Stadium matches and away games. Devoted Celtic fans travel to other cities to cheer for their beloved SPL side and favorite players! Join in the excitement and fun - sit with other Celtic fans and enjoy the matches! Buy hot Celtic tickets online at 1st4FootballTickets.com and enjoy an unforgettable football afternoon or evening at Celtic Park with local fans. You can buy tickets for Celtic at 1st4FootballTickets.com securely online - or you can call our football ticket hotline @ UK TEL: 0871 284 5277! Every Celtic ticket order from 1st4FootbalTickets.com comes with a 150% guarantee, and will be delivered to your home, hotel, or office ASAP by our reliable partners FedEx and Royal Mail Special Delivery. 1st4FootballTickets.com has served thousands of satisfied Celtic fans for more than seven years. We offer friendly customer service, sold out tickets, and last minute bookings for one or more Celtic football tickets from our highly secure football ticketing website. Hot tickets for Celtic football hospitality can be purchased online or by calling our football ticket hotline. 1st4 Football Tickets.com is not affiliated with the FA, UEFA, FIFA or any other football organizations.